The search for the perfect jeans can take you to many stores and through many pairs in a dressing room, only to get them home, wash them and find that they fit completely different! 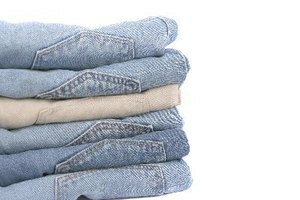 Washing jeans in warm or hot water and then drying them will shrink jeans. The good news is that the results are usually not permanent. Denim is a relatively forgiving material as long as you don't make the same mistakes repeatedly. 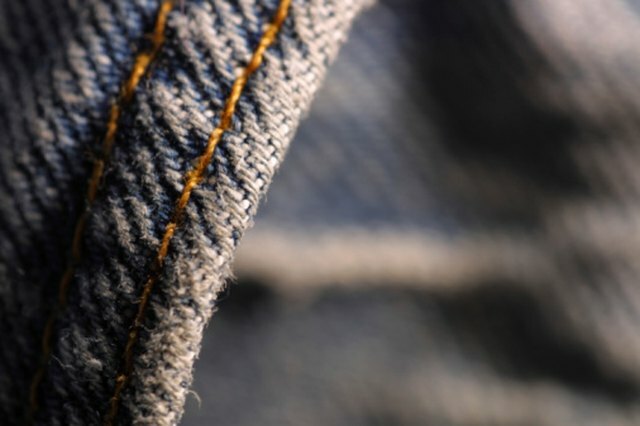 Turn your jeans inside out and place them in the washing machine by themselves or with a few other pairs of jeans. This will give them plenty of water to absorb in order to regain their original shape. Either soak the jeans with only water or wash them on the gentle cycle. All you need here is the water to bring back the elasticity. If washing, pour the recommended amount of a gentle detergent such a Woolite in the machine. Woolite also makes "Woolite Dark" for dark clothes if your jeans are dark and you are concerned about preserving the color. Add fabric softener during the rinse cycle if you are looking for softer jeans. If time is an issue, you can spray you jeans down with a water bottle instead of soaking or washing. Note that this will not allow as much water into the fibers and may result in a more difficult stretching process. Put the still damp jeans on. This may take a bit of maneuvering to get the cold wet jeans up and buttoned, but take your time and eventually they will comply. Walk around in your jeans, doing squats and lunges. This step will stretch the jeans, as the damp denim is more likely to be molded and stay the way it drys. Avoid upholstery as you may stain light fabric with your wet jeans. If you want to sit on a couch, place a few towels down, folded in half to make sure your jean color doesn't leak through to the couch. If the length in your jeans need to be stretched, take off the jeans and step on the waistline. Pull the legs up and away from the waistline to stretch. Stretch until you see a noticeable difference, trying on to ensure you've reached the right length. Take off the jeans after you have achieved the correct stretch and allow to finish air-drying. The stretch should be efficient, and although your jeans may feel a little stiff at first after drying them completely, they will soon fit to the contours of your body. Always wash jeans inside out to preserve color and texture and avoid the dryer all together to keep your jeans from shrinking repeatedly. How Do I Shrink My 98%/Cotton 2% Spandex Jeans?